As fibre deployment has become mainstream, splicing has naturally crossed from the outside plant (OSP) world into the enterprise and even the data centre environment. Fusion splicing involves the use of localized heat to melt together or fuse the ends of two optical fibres. The preparation process involves removing the protective coating from each fibre, precise cleaving, and inspection of the fibre end-faces. Fusion splicing has been around for several decades, and it’s a trusted method for permanently fusing together the ends of two optical fibres to realize a specific length or to repair a broken fibre link. However, due to the high costs of fusion splicers, it has not been actively used by many people. But these years some improvements in optical technology have been changing this status. Besides, the continued demand for increased bandwidth also spread the application of fusion splicing. Fusion splicers costs have been one of the biggest obstacles to a broad adoption of fusion splicing. In recent years, significant decreases in splicer prices has accelerated the popularity of fusion splicing. Today’s fusion splicers range in cost from $7,000 to $40,000. The highest-priced units are designed for specialty optical fibres, such as polarization-maintaining fibres used in the production of high-end non-electrical sensors. The lower-end fusion splicers, in the $7,000 to $10,000 range, are primarily single-fibre fixed V-groove type devices. The popular core alignment splicers range between $17,000 and $19,000, well below the $30,000 price of 20 years ago. The prices have dropped dramatically due to more efficient manufacturing, and volume is up because fibre is no longer a voodoo science and more people are working in that arena. Recently, more and more fibre being deployed closer to the customer premise with higher splice-loss budgets, which results in a greater participation of customers who are purchasing lower-end splicers to accomplish their jobs. The first and primary use of splicing in the telecommunications industry is to link fibres together in underground or aerial outside-plant fibre installations. It used to be very common to do fusion splicing at the building entrance to transition from outdoor-rated to indoor-rated cable, because the NEC (National Electrical Code) specifies that outdoor-rated cable can only come 50 feet into a building due to its flame rating. The advent of plenum-rated indoor/outdoor cable has driven that transition splicing to a minimum. But that’s not to say that fusion splicing in the premise isn’t going on. Longer distances in the outside plant could mean that sticking with standard outdoor-rated cable and fusion splicing at the building entrance could be the more economical choice. If it’s a short run between building A and B, it makes sense to use newer indoor/outdoor cable and come right into the crossconnect. However, because indoor/outdoor cables are generally more expensive, if it’s a longer run with lower fibre counts between buildings, it could ultimately be cheaper to buy outdoor-rated cable and fusion splice to transition to indoor-rated cable, even with the additional cost of splice materials and housing. As fibre to the home (FTTH) applications continue to grow around the globe, it is another situation that may call for fusion splicing. If you want to achieve longer distance in a FTTH application, you have to either fusion splice or do an interconnect. However, an interconnect can introduce 0.75dB of loss while the fusion splice is typically less than 0.02dB. Therefore, the easiest way to minimize the amount of loss on a FTTH circuit is to bring the individual fibres from each workstation back to the closet and then splice to a higher-fibre-count cable. This approach also enables centralizing electronics for more efficient port utilisation. In FTTH applications, fusion splicing is now being used to install connectors for customer drop cables using new splice-on connector technology and drop cable fusion splicer. A significant increase in the number of applications supported by data centres has resulted in more cables and connections than ever, making available space a foremost concern. As a result, higher-density solutions like MTP/MPO connectors and multi-fibre cables that take up less pathway space than running individual duplex cables become more popular. Since few manufacturers offer field-installable MTP/MPO connectors, many data centre managers are selecting either multi-fibre trunk cables with MTP/MPOs factory-terminated on each end, or fusion splicing to pre-terminated MTP/MPO or multi-fibre LC pigtails. When you select trunk cables with connectors on each end, data centre managers often specify lengths a little bit longer because they can’t always predict exact distances between equipment and they don’t want to be short. However, they then have to deal with excess slack. When there are thousands of connections, that slack can create a lot of congestion and limit proper air flow and cooling. One alternative is to purchase a multi-fibre pigtail and then splice to a multi-fibre cable. Inside the data centre and in the enterprise LAN, 12-fibre MPO connectors provide a convenient method to support higher 40G and 100G bandwidth. Instead of fusing one fibre at a time, another type of fusion splicing which is called ribbon/mass fusion splicing is used. Ribbon/mass fusion splicing can fuse up to all 12 fibres in one ribbon at once, which offers the opportunity to significantly reduce termination labor by up to 75% with only a modest increase in tooling cost. Many of today’s cables with high fibre count involve subunits of 12 fibres each that can be quickly ribbonized. Splicing those fibres individually is very time consuming, however, ribbon/mass fusion splicers splice entire ribbons simultaneously. Ribbon/mass fusion splicer technology has been around for decades and now is available in handheld models. Fusion splicing provides permanent low-loss connections that are performed quickly and easily, which are definite advantages over competing technologies. In addition, current fusion splicers are designed to provide enhanced features and high-quality performance, and be very affordable at the same time. FS provides various types and uses of fusion splicers with high quality and low price. For more information, please feel free to contact us at sales@fs.com. This entry was posted in Fiber Testers & Tools, Fusion Splicer and tagged 100G, data centre, drop cable fusion splicer, FTTH, fusion splicers, fusion splicing, mass fusion splicers, MTP/MPO on November 21, 2015 by Admin. Fiber fusion splicer is a device used to join two optical fibers end-end by fusion (sometimes called welding or heating). By using an electric arc, two optical fibers can be melted together at their end faces, forming a single long fiber. The source of heat is usually an electric arc, but can be a laser, or a gas flame and so on. And the resulting joint, or fusion splice, permanently joins the two glass fiber end to end so that optical light can pass from one fiber into the other with very little loss. As an dispensable tool for fiber outside plant (OSP) and indoor cable network installation, fiber fusion splicers are widely used in optic network installation. A long-haul and high-capacity fusion splicer can splice optical fibers of high performance , helping establish a low-loss and high-speed telecommunication line. Contributing in telecommunications, medical application, image progress, energy research where light matters, those splicers have an great influence on connecting optical fibers with superior precision to ensure data are transmitted reliably anywhere. According to different splicing technologies, fiber fusion splicers can be classified into three types: core alignment splicer, ribbon fiber fusion splicer and special fiber fusion splicer. It is mostly used in the world. With optical fiber aligned by a movable v-groove alignment mechanism and heated by electric discharge between tungsten electrodes, these fiber splicers can measure core position with high accuracy. It is an essential tool to enhance work efficiency in the case ribbon fibers are applied. since each pitch of fiber is as narrow as 250um on ribbon fiber, it is difficult to apply movable v-grooves for each fiber. Thus, fixed v-groove is used for ribbon fiber splicing which can shorten the operation time for ribbon fiber fusion splicer is spliced all at once. It has developed an adjustable fiber clamping position mechanism, electrode oscillating mechanism, and optical fiber end-view image observation system in order to splice various types of fibers, such as polarization maintaining fibers and large diameter fibers for high power laser transmission. 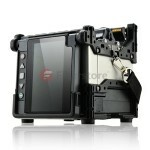 In recent years, as optical fiber has been connected to homes, demand of compact and light fusion splicers are rising. Fusion splicers are been updating into smaller and lighter ones with higher capacity, lower loss and greater productivity instead of big, heavy and, expensive and easily damaged old ones. For instance, Fujikura, the leading splicer brand in the world, has developed a comprehensive range of fusion splicer products to cater for every application in the last 30 years. It lately has invented the FSM-80S alignment fusion splicer succeeding to FSM-60S. The 80S has a series of new features, such as ” Automated wind-protector and tube-healer” for quicker splicing cycle as well as fewer operation steps, “innovative carrying-case design” for quicker preparation and so on. It is obvious that it has plenty of advantages over older ones in many aspects. Fiberstore offers all kinds of fusion splicers with high quality. Welcome to visit our website and get more information. This entry was posted in Fiber Testers & Tools, Fusion Splicer and tagged Fiber Fusion Splicer. Fujikura FSM-80S on April 11, 2015 by Admin. The most common parts of a fibre fusion splicer include Electrodes and V-Grooves. Fusion splicers are dependent upon high-quality electrodes to focus that critical arc of electricity. As the electrodes wear from use, electrodes gradually worn and lead to weaker splices and higher splice losses. Cleaning electrode is part of the essential maintenance of fusion splicer and will not restore the performance of the fusion splicer as electrodes need to be replaced. Always replace fusion splicer electrodes as a pair. For optimal performance, electrodes should also be aligned when they are replaced. This is a tuning process to maximise the performance of your splicer. 1. Electrical welding electrode life is generally about 2000, after a long time the electrode will be oxidized, resulting in the discharge current is too large leaving the splice loss value increases. You can remove the electrodes, medical cotton wool dipped in alcohol to gently wipe and then install the fusion splicer, and discharge cleaned once. If repeated washing, the discharge current is still too large, it shall replace the electrode. Replace the electrode first remove the protection of the electrode chamber cover, loosen the screws fixed on the electrode, remove the upper electrode. Then release the top wire fixed to the lower electrode, remove the lower electrode. Installation of new electrode opposite action of the demolition order, require two electrode tip clearance: 2.6 ± 0.2mm, with the optical fibre symmetry. Under normal circumstances electrode is not required to be adjusted. Not touch the tip of the electrode in the replacement process, prevent damage, and should avoid the electrodes to fall inside the machine. After replacing the electrode to carry out calibration of the arc position. Care of the electrode used for a long time, the tip of the electrode will produce sediment discharge poor, then there will be a “hissing” sound, then need to clean the electrode. The recommended the regular welding machine electrodes care that clean the electrode. a. Off the windshield of the welding machine. b. Open the fibre optic pressure head and the clamping platen. c. Stick with a cotton swab dipped in anhydrous alcohol (or sharpened toothpick) single wipe in a V-Groove Fibre Aligner. Note: Avoid using hard objects to clean the V-groove or V-groove on the force, to avoid bad V-groove or V-groove inaccurate, resulting in the instrument can not properly use. Proper use of Fusion Splicer is to reduce an important guarantee of the optical fibre splice loss and key links. You always should be strictly in accordance with the instructions of the welding machine and operational procedures. And properly set the welding parameters according to the type of fibre (including pre-discharge current, time and the main discharge current, the main discharge time). Do as above, the working life of your fusion splicer certain can be longer. This entry was posted in Fusion Splicer and tagged fibre fusion splicer, fusion splicer electrodes, V-Groove Fibre Aligner on July 15, 2013 by Admin.